4- Open the program with the interface connected ,,( choose NON DEALER,when open program for first time ) , keep vcm turn on,on the computer. 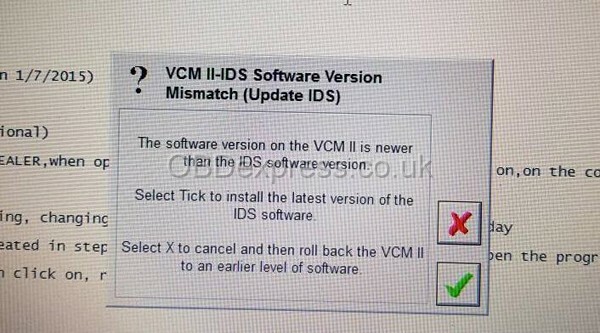 The software version on the VCM II is newer than the IDS software version. Select Tick to install the latest version of the IDS software. 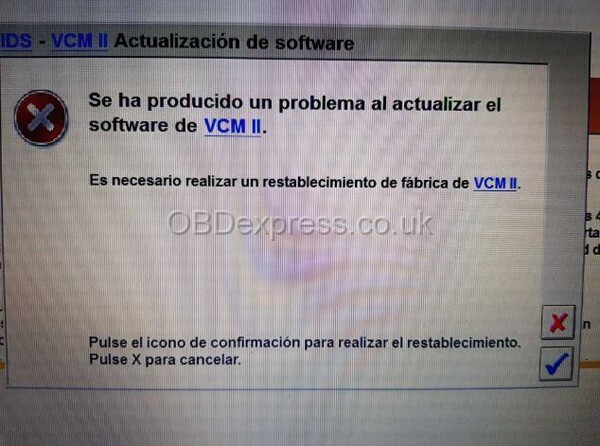 Select X to cancel and then roll back the VCM II to an earlier level of software. Here is tutorial of step-by-step how to install Mangoose Pro GM II Cable and how to use. copy “GM Ⅱ” to harddisk. Step 1, open Tech2Win, use the default image. Step 2, open GlobalTIS for Opel v32 and select security access. Get security access. Tech2Win license will refresh and it will unlock Tech2Win so it will communicate with the car. Close Tech2Win. Step 3, plug in the Mongoose Pro II GM and plug the other end into the car. Step 5, Tech2Win prompts you to use the Mongoose, so, use the Mongoose. Step 6, you will see the Saab 9.250 NAO splash screen. Notice the license expiration says <1 instead of 0, and you will not see any “circle with a line through it” through the Tech2 picture, the MDI picture, etc, because Tech2Win is unlocked. Step 9, use TIS2000 to get security access. Turn “off” Tech2Win using the power button in the GUI, which basically resets the software. Fire up TIS2000 and select Get Security Access. Note, you may have to adjust the baud on the serial connection, I had to drop mine a bit before things played nicely. Also, unplug the Mongoose while you are doing all this nonsense. Step 10, BOOM you got yourself some security access. If you got this far, celebrate! Step 11, plug the Mongoose cable back in, hit the power button and restart Tech2Win. You are good to go, you have full security access. Feel free to do whatever you want! Here is me jacking around with some of the diagnostics. I used this same software to re-program the BCM on my 2008 9-3 CV. It works. Step 12, SPS! Close out all this crap and open GlobalTIS for Saab. Open SPS. Plug in Mongoose. Basically, it just works. It will show up in the list as an available adapter. Follow the directions. Here are some pictures of me updating the ECU for my 2007 9-3 2.0T to eliminate the idle dip problem I occasionally experienced. Most of what I wrote omits some tips and tricks but was designed to show, yes, this tool works, its compatible 100% with 2003+ 9-3SS for sure, and I love it. I don’t know how I put up with the Chinese junk. No more time bombs. Plus this setup works for my 2007 Yukon XL Denali. If I buy a car with the Global A electrical platform, the Mongoose is certified to work with GDSII also! So it’s pretty much future proofed. Here are some more random photos of my setup and of the Mongoose plugged in and…Mongoosing? My recommendation? If you are the least bit handy with computers, buy this thing and never look back.